I vaguely remember the Internet. By the time I left The States, I had already begun to wean myself. I was laid off for 5 months before I left, and though the Internet is fun and limitless, a person uses it a lot less often when s/he isn’t forced to sit in front of a computer for 8 hours every day. That said, being completely disconnected after we arrived here was a culture shock. But now, it’s not too big a deal. And some parts are literally unimaginable. I post to my blog nearly every day, but besides that and Skype. Occasionally I look up random questions on Wikipedia (e.g. Who hosted “The Late Late Show” after Craig Kilborn?). But other than that, I barely use the Internet any more. The dial-up is too slow and too costly to use for more than a little bit at a time—also, after years of using broadband, a dial-up connection can be irksome. 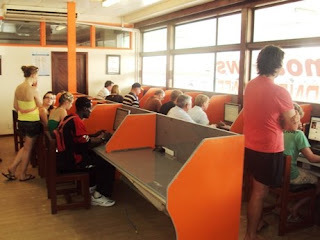 The only real Internet I ingest is my weekly trip to the Internet Café to download podcasts. While things are downloading, I’ll look around Facebook and check on my fantasy baseball team. Both of those require a lot more bandwidth. But after that, I start scraping the bottom of the barrel looking for things to do. So much of the Internet is based on repetition or following something that’s ongoing; following a news story, following a blog, following . All these things are based on a constant or recurring presence with that part of the Internet. I used to enjoy reading the San Francisco Chronicle online and I would often skim HuffingtonPost, but it’s difficult to look at a news site once a week and pick out the big stories from the minor stuff. The 24-hour news cycle makes a snapshot glimpse pointless. And Twitter. What the hell is Twitter? When volunteers come together, we often speculate on what exactly Twitter looks like or how it works or how a person uses it. I got a Twitter account early on before it took off, and it was a terrible user experience back then. So I assumed it’s improved greatly, but I still have a difficult time imagining it. The consensus hypothesis is the interface probably resembles the Facebook Newsfeed. In any case, there inevitably comes a point at the Internet Café when I start looking for things to do. It’s like I’ve forgotten how to surf. Today I went to Metacritic to see what’s going on there. I had never heard of any of the top ranked music, and maybe one or two of the top reviewed movies. So I shrugged, and checked how much time I had left. I nearly resorted to watching the percentages grow. I’ve mentioned before that RPCV Dylan used to keep lists of things to do on the Internet, which doesn’t seem like a bad idea. Liam and Chris and others send me links to YouTube, so that could be something to do. Or maybe I’ll just keep to Wikipedia and dreams of Twitter. I hope you’re connecting. Pictures will be posted later this evening. 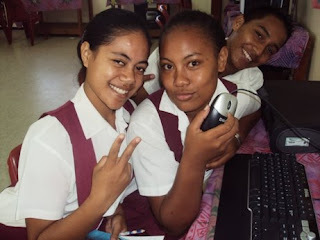 Lise with the peace/victory/USC sign, Amanda holding the mouse, Solinuu being an adolescent male. 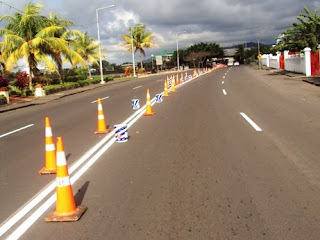 Painting the lines on the street to prepare for the street switch. in my opinion, you're not missing much on the internet! you're getting REAL information living REAL experiences - you can't beat that! 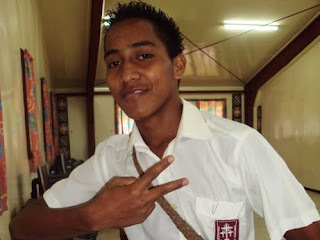 The Samoan youth and people are SO beautiful! Love them!